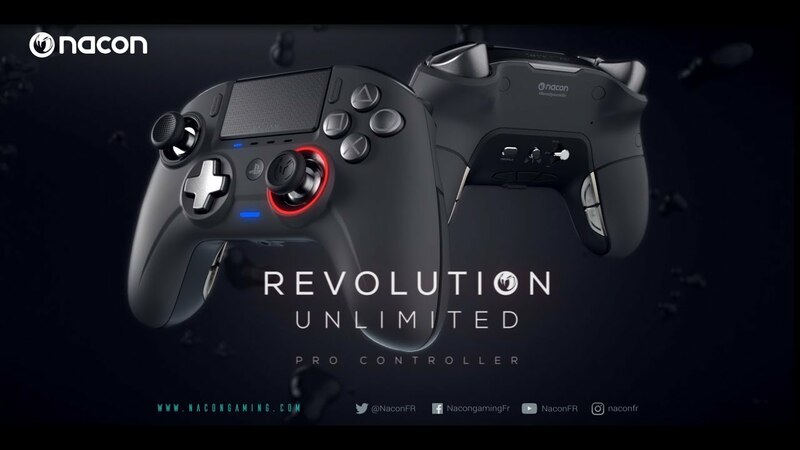 NACON, designer of gaming accessories, is proud to announce the REVOLUTION Unlimited Pro Controller, a new licensed controller equipped with a wireless mode for PlayStation®4 (PS4™), is now available throughout Europe at a recommended retail price of £149.99. NACON’S REVOLUTION Unlimited Controller offers a range of customisation options in both hardware and software. All created to please the most competitive gamer. Light bar and speaker not included or available. NACON’s REVOLUTION Unlimited Pro Controller is now available at a recommended retail price of £149.99. * Windows® 7/8/1O PC or macOS X (El Capitan), macOS 10.12 (Sierra) macOS 10.13 (High Sierra), mac OS10.14 (Mojave) and Internet connection required, registration required to download the software. ** PC Advanced mode not tested nor endorsed by Sony Interactive Entertainment Europe. REVOLUTION Unlimited Pro Controller wirelessly connects to your PS4™ via the included USB receiver.